Silly place to build a cathedral, in the middle of a bog. Winchester Cathedral’s crypt floods most winters, which means the holy well, important for healing back then, is inaccessible for weeks at a time, and of course, subsidence. Yet they weren’t short of space in Winchester during the seventh century, so why didn’t they build it on higher ground nearby? Unlike building today, they weren’t constrained by a shortage of land, planning permission, building regulations or health and safety, they were able to look at the bigger picture. And that meant considering the sacred landscape around them. And that, in turn, meant ley lines. The Belinus Ley line connects 6 major cities and hosts many sacred sites. Our speakers, Gary Biltcliffe and Caroline Hoare, on Saturday 22nd March, demonstrated the importance of ley lines across Britain, both then and now. They have dowsed and travelled and researched the daddy of all ley lines, the Belinus Line, which crosses the country from north to south like a spine. It stretches from the Isle of Wight in the south to Durness on the furthest tip of Scotland in the north. The ley itself is intertwined by two other energy lines, the male energy they called Belinus, after King Belinus, who ruled and built roads 380–363 BC, and the female energy they named Elen. And the things they discovered along its length are more than mind blowing. For a start, the two serpent-like energy lines cross at 22 points of fusion, and there are 33 nodes, or energy centres. 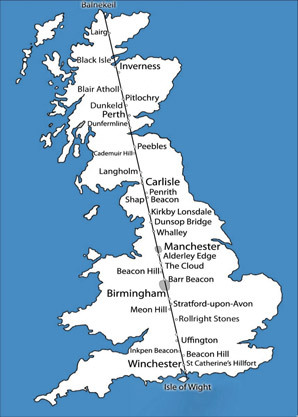 It connects six major cities: Winchester (England’s capital before London); Birmingham, Manchester, Carlisle, Dunfermline (Scotland’s capital before Edinburgh); and Inverness. Cities destined to become historical centres of power. Then the ley links a chain of beacons, hills where they would have lit beacon fires as a warning or in celebration. En route our speakers also found holy wells, sacred stone circles, pre-designated battle sites, rivers and important crossing places. The Belinus line takes us from the Isle of Wight, inexorably north. The views along its route to the north are magnificent, spell binding, revealing. Whereas if you turn around and look south, the views are hidden, shielded, less inspiring. So where is it taking us? Where is it pointing, directing us to? You guessed it, astrologically and astronomically aligned with Cignus (meaning swan), and the Milky Way, where they believed back then our souls came from - and returned to. 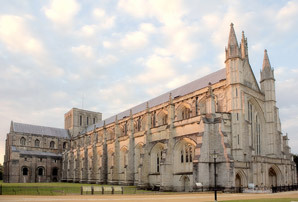 And that is why Winchester Cathedral had to be built on a bog. Alignment of the sacred landscape was paramount. Our next meeting will be on Thursday 10th April when Adrianne Jones dresses in medieval clothing and tells us about medicine and herbs of that time.